Create With Me: Happy Birthday Pardner! Howdy Stampers! 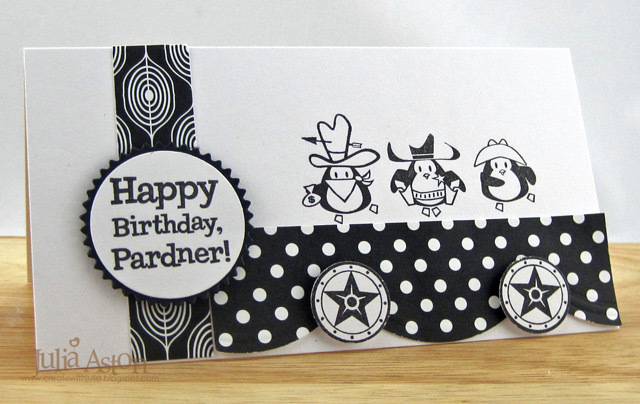 I made this cute little penguin Western card for the Cas-ual Fridays challenge Penguin Suit - to use only black and white - not a SPOT of another color! It was so hard for me not to color in the sheriff's badge - or the bandana - or one of the little critters hats! but I persevered - and here it is - pristine in its' black and whiteness!! The stamps are from The Cat's Pajamas - the paper is Papertrey Ink - the large scallop is a punch by EK Success. The sentiment is layered to a Pinking Circle Nestability. I popped up the stars and sentiment on foam tape for a little dimension. My card is a slim 3" x 5 1/2"
A good masculine card, don't you think?? Accessories - Foam tape, circle punches, Pinking Circle Nestabilities, Scallop Edge punch EK Success. this has got to be the cutest card...those stamps are so adorable...so fun..
Love the graphic b&w! Very cute! those penguins are just the cutest things i've ever seen!!! love it! What a beauty ! fabulous card and I just love those stamps beautifully crafted and so fun and stylish. Those penguins are so unique! What a FUN card! I love black and white together -- but like you it's hard to not add just a splash of color! Love your card too -- I need to get busy and make some card love suitable for kids! What a beautiful card Julia. Cute, cute images-love the black and white!! Well this is a rootin' tootin' penguin parade! What a fabulous card!